A Russian Soyuz 2-1A launch vehicle has launched with the Metop-B satellite into orbit for the European Space Agency (ESA) and EUMETSAT (European Organisation for the Exploitation of Meteorological Satellites). The 25th mission of Arianespace’s Starsem affiliate was on schedule, with liftoff at 16:28 GMT on Monday from Baikonur Cosmodrome’s PU-6 LC31 launch complex. 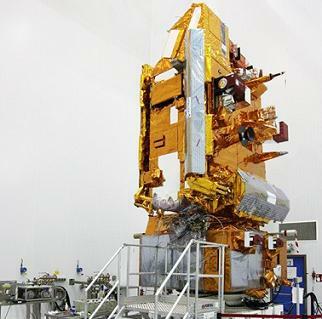 The European operational polar orbiting weather satellite – which has a liftoff mass of approximately 4,085 kg – was designed and manufactured by Astrium. It was developed as a joint undertaking between ESA and EUMETSAT, and is the second of three nearly identical satellites to provide continuous weather observations until 2020, following MetOp-A – which was orbited by Starsem in October 2006 on a Soyuz mission from Baikonur Cosmodrome. The satellite also includes instruments delivered by the Centre National d’Etudes Spatiales (CNES) and the National Ocean and Atmosphere Administration (NOAA) from the United States. The Metop satellites form the space segment of the EUMETSAT Polar System. In addition to service provided by the MetOp spacecraft from polar orbit, EUMETSAT also operates the Meteosat series of satellites in geostationary orbit. Its current Meteosat-8 and Meteosat-9 platforms are positioned over Europe and Africa, while Meteosat-7 is located over the Indian Ocean. Meteosat-7 – orbited by Arianespace during 1997 from the Spaceport in French Guiana on an Ariane 4 launcher – was the final operational satellite in the Meteosat First Generation (MFG) series of observation platforms that provided reliable imaging of the full Earth disc along with data for weather forecasts during decades. Meteosat-8 and Meteosat-9 – launched by Arianespace aboard Ariane 5 vehicles from the Spaceport in August 2002 and December 2005, respectively – initiated the Meteosat Second Generation (MSG) satellite series. They were joined by Meteosat-10, which currently is undergoing a commissioning process after being lofted in July 2012 by Arianespace on another Ariane 5 mission. The Soyuz-2 is a modernised variant of the Soyuz rocket, itself a derivative of the R-7 Semyorka, the world’s first intercontinental ballistic missile. After the cancellation of the military Soyuz programme, eight Soyuz-M rockets were used to launch Zenit-4MT reconnaissance satellites, with launches occurring between 1971 and 1976. 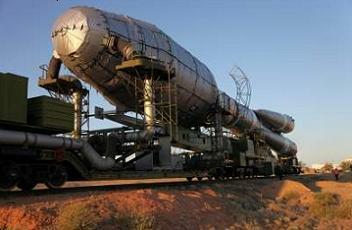 The Soyuz-2 made its maiden flight in 2004, in the Soyuz-2-1a configuration. 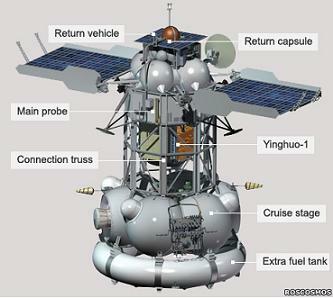 It carried an obsolete Zenit-8 reconnaissance satellite, refitted with test instrumentation, on a suborbital trajectory. It is not entirely clear whether the mission was intended to be suborbital, or whether the rocket actually failed to achieve orbit. 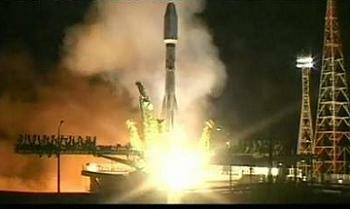 The first launch into orbit occurred in October 2006, when a Soyuz-2-1a/Fregat deployed the MetOp-A weather satellite. The Soyuz-2-1b made its maiden flight later the same year, carrying the COROT exoplanet detection satellite. The Fregat upper stage, which is propelled by unsymmetrical dimethylhydrazine and nitrogen tetroxide fuelling an S5.98M engine, will be used to place the satellite into their target orbit. The Fregat, which is making its thirty first flight, has been used as a fourth stage on Soyuz-U, Soyuz-FG and Soyuz-2 rockets, and also as the third stage of the Zenit-3F. Only two launches of Fregats have failed to date. One of these, the Soyuz-2-1b launch, failed before the Fregat had even fired, and the upper stage was not responsible for the anomaly. The other failure was caused by the Fregat; the May 2009 launch of the Meridian 2 satellite ended in failure after a programming error led to the Fregat expending propellant at a greater rate than it should have, and it ran out of fuel during the second of three planned burns. The propulsion system of the Fobos-Grunt spacecraft, which failed to depart Earth orbit on a mission to Mars’ moon Phobos, was also based on the Fregat, however it was modified, and it is unclear what the cause of the spacecraft’s failure was.